Not sure if this is the right part of the forum to post this. I have a few questions about BGE or BRPG. I was looking for a SAGA Dark Age template for either BGE or BRPG but couldn't find one. Has anybody produced anything for SAGA Dark Age ? Also, if there isn't one, I am not sure which s/w package would be best to create one either BGE or BRPG? SAGA Dark age is an immersive game of Viking Age skirmish level conflict between two or more Warlords. So it uses individual soldiers, grouped into small units, rather than large armies, over a board about 48" x 36". A quick forum search found nothing for SAGA Dark Age. I couldn't even find it on boardgamegeek.com or on rpggeek.com. From what you describe, and what I saw on the publisher's website, I think either program would be well suited, but BGE is the more economical option. Check out the features that will be coming to BGE v1.8, shown in this video, paying particular attention to the unit grouping section. You might also want to pick up this Vikings token pack. 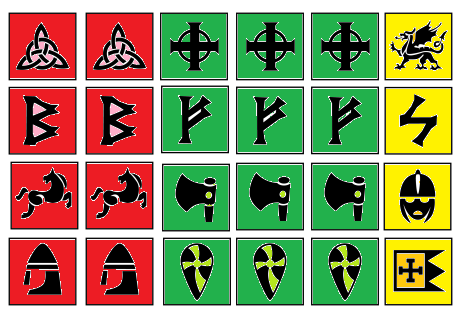 Or maybe these symbols will do. Or scan them from pg 72 of the SAGA rulebook. Once you've got each die face as a stand-along image, it's a snap to make the custom dice in BGE (or BRPG). Thanks for the replies. I will give BGE a try and see what I can come up with. What a great bundle. I'm glad I've seen this post. That's like 10 cents per token, which is nothing. Cheers, Heruca!